For most of the year, I prefer to drink rich and flavorful styles of beer, i.e. Porters, Stouts, IPAs, etc.. But when the weather gets as warm as it’s been, I prefer lighter beers, and the occasional mixed drink. With that in mind, I decided to pick up a six-pack of Troegs Sunshine Pils, which I hoped would cool me off during the dog days of summer. When I first tried this beer two weeks ago, it didn’t make much of an impression. I had an IPA prior to drinking it, and quite frankly, it couldn’t hold its own against the strong flavored IPA. Tonight I decided to give it a second chance (mostly because there were still four bottles left in the fridge, and I don’t usually go out to buy more until I finish what I have in stock). The beer has a clear golden color and a thin head which dissipates rather quickly. I’m not sure how to describe the aroma. All I can say is that it smells like beer (that’s pretty normal right?). As far as the flavor, the Sunshine Pils has good carbonation and a crisp, clean finish. Not too malty, not too hoppy. The name describes it perfectly: a light, refreshing beer that can be enjoyed on a sunny day while relaxing by the pool. I give this beer a C+/B-. Didn’t I raise you better than that? 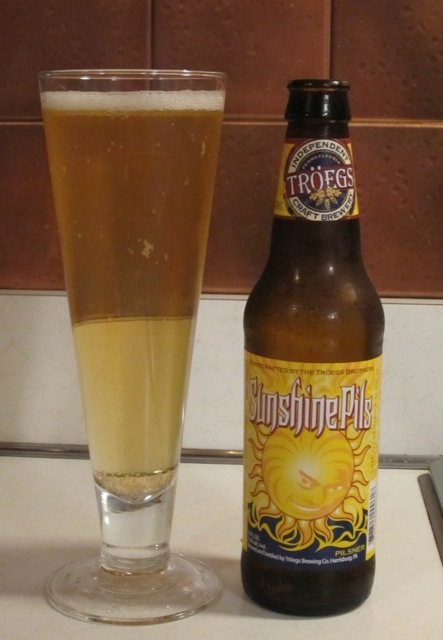 Troegs Sunshine Pils is a mediocre pilsner (you’re C+ is close enough but we don’t follow the No Beer Left Behind Program so I wouldn’t post a B-). In any event, it has a mild straw aroma with hints of lemon zest but you need to jam a Patinkin-worthy schnoz into a brany snifter of the stuff to pick any of that out. Victory’s Prima Pils is a notch above but for my quickly dwindling money, you can’t beat a Trumer Pilsner. Unfortunately, you can’t get a Trumer Pilsner in the Republik of New Jersey either. As I look back on this response thanks to the “I know my Man v. Food Philly episode trap door mind” of G-LO, I stand by the comments – especially the Patinkin schnoz line – that was good stuff. However, I did neglect to commend you on using a pilsener glass for a Pilsener. So you say I need a “Patinkin-worthy schnoz” to pick up any of these subtle aromas, yet I say “smells like beer”, and that is somehow out of line? I TRIED to pick up something other than the classic “beer” smell, but alas, I got nothing! Perhaps I should pour myself another (3 left!) and try again. I’ll give you that faint smell of citrus though. It was in there somewhere! That was from the same batch. Since I’m not to pleased with it, it’s taken awhile for me to get through the six-pack. I don’t think I care for pilsner much either. My palate is too used to funky I think. If it’s ho-hum, I don’t seem to be as into it. I hear the Victory Prima Pils is better, and then there’s Pilsner Urquel. I’m thinking I’m more of an ale guy.